As I blast my right arm upward to clear Albert's hand from my head, I turn my body in a counterclockwise direction. As I continue to circle around Albert, I pull his head in a counterclockwise direction with my left hand. Still pulling Albert's head in a counterclockwise direction with my left hand, I step my right foot behind him and hook my right arm over his back. I secure my position by dropping my weight down on Albert's back and locking my arms tight around his body. 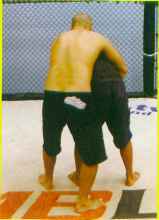 To learn how to take your opponent's back from here, see the next technique.